Listed below are three example of the types of trips that Full Moon On The River offers. Each of these trips includes a pre-trip meeting to familiarize the group with equipment, trip organization, travel and the route plan. The meeting is usually one or two weeks prior to the trip (see current schedule for location and times). Depending on your (or your group's) needs, the details for these trips are often negotiable, including the fee. Just give Sandra a call and you can make special arrangements with her. Note:Since Full Moon On The River's new base location is now Elliot Lake, ON, we are currently exploring canoe tripping options (of which there are many!) around the area. So, if you want a truly northern experience and don't mind the drive, call us! This river is very beautiful and scenic. The portion that we do begins at Harris Lake (off Hwy 69 South of Britt, North of Parry Sound). We begin Friday night and paddle to a lovely island campsite for set up and campfire chats. Saturday is a full but rewarding day of paddling and portaging. There are no rapids on this route and the current is barely felt. This feels more like small lake paddling. We do two portages on Saturday, each under 600 metres. One is quite mucky so bug spray and patience are suggested. Saturday night’s campsite is spectacular. It is large and sits on a piece of land between two lakes. It is, in fact, Sunday morning’s first portage of the day. Sometimes, we prefer to do the portage on the Saturday and camp at another gorgeous spot on the next lake. Three Legged Lake Access This trip is in a Provincial park on Georgian Bay. It is another beautiful trip. It is one of the more relaxing trips yet, depending on how it is done, it can be challenging. 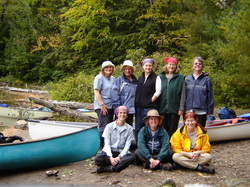 We start our paddle Friday at about 6:30 p.m and approach the first portage (200 metres, clear trail). In the fall, we paddle to campsite 1 or 2, and in Spring, we often continue on to a choice of sites closer to our planned day trip for Saturday. On Saturday, we either pack up and change spots to a very secluded one beyond a portage (about 500 metres and somewhat challenging) and over a beaver dam. This spot is beautiful and is situated on a small lake. This excursion can be a day trip for lunch or the next days route to the campsite for the second night. Either way it is absolutely lovely and peaceful. On Sunday, we paddle and portage back out to the car park. We go the same way we came in, so Sunday tends to be a productive day. Algonquin Park takes a little longer to get to so we do a Saturday morning start in Fall or a Friday evening start Spring because of the longer daylight hours. We start this trip at Smoke Lake.